Liposomal suspension for the daily care and hygiene of the lashes, eyelids and the eyelid margin. What is special about CALMO® Lid Care? CALMO® Lid Care is fragrance free, paraben free and tenside (soap) free. Due to the absence of these and other irritants, CALMO® Lid Care is suitable for sensitive skin. 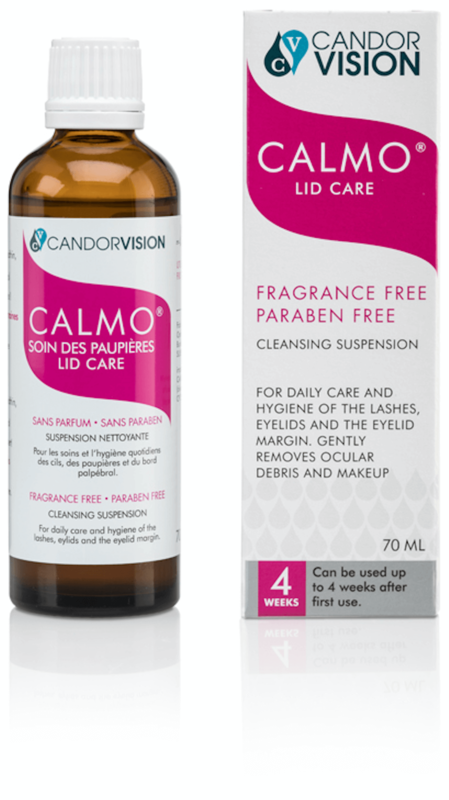 CALMO® Lid Care is Canada’s first and only liposomal suspension for the daily care and hygiene of the lashes, eyelids and the eyelid margin. CALMO® Lid Care contains only aqua, sodium chloride, lecithin, phenoxyethanol, alcohol, retinyl palmitate and tocopherol. CALMO® Lid Care gently removes ocular debris and makeup. Using CALMO® Lid Care as directed is an effective way to keep your eyelids and skin clean and moisturized. Regular eyelash, eyelid and eyelid margin hygiene can be important for patients with blepharitis, ocular rosacea, conjunctivitis and dry eye. If you have any of this or other eye disorders, ask your doctor before using CALMO® Lid care for daily eyelid hygiene. How does CALMO® Lid Care work? Instead of tensides (soap), which take away the physiological lipids produced by the Meibomian glands (and thus can destroy the lipid layer of the tear film), CALMO® Lid Care contains liposomes, which gently and effectively cleanse the eyelid margins and have a stabilizing effect on the lipid layer of the tear film. How to use CALMO® Lid Care? CALMO® Lid Care should be used twice daily - in the morning and evening. CALMO® Lid Care should be applied with lint-free (cotton) pads that are suitable for eyelid care. To avoid contamination, the dropper should not come into contact with any surfaces, especially not the cotton pad. Please drop CALMO® Lid Care onto the cotton pad from a short distance. During daily care and hygiene of the eyelid margin with CALMO® Lid Care, all crusts and deposits should be thoroughly removed. It is recommended that you wash your hands before application. Then moisten the eyelids, specially the eyelid margins and the base of the eyelashes with a saturated cotton pad and gently massage the eyelid margin along the upper and lower edge of the eyelid. Carefully remove any crusts and deposits that are present. To cleanse the eyelid margins, it is recommended that the lower eyelid should be gently pulled downward with one finger of the free hand or the upper eyelid should be gently pulled upward, so that the eyelid margin can be easily reached. If necessary, replace the used cotton pad with a new one. Discard the used cotton pad after cleansing each eyelid. Do not use the same cotton pad for both eyelids. Do not apply CALMO® Lid Care directly into the eyes. Do not touch the inside of the eyelids or the eye surface with the saturated cotton pad. Tip: It might be helpful to place warm compresses or a reheatable mask on the closed eyelids before using CALMO® Lid Care. This facilitates the liquification of any existing mucous clots and secretions from the sebaceous glans and their subsequent easy removal. Is CALMO® Lid Care suitable for contact lens wearers? Yes, although it is recommended that contact lenses be inserted after CALMO® Lid Care has been used. Can CALMO® Lid Care be used after surgery? In the event of eye surgery, speak with your doctor before using CALMO® Lid Care. When should you not use CALMO® Lid Care? CALMO® Lid Care should not be used in case of hypersensitivity to any of the ingredients. How is the appearance and fragrance of CALMO® Lid Care? Due to its liposomal formulation, CALMO® Lid Care is an opalescent liquid with a milky appearance and the characteristic natural fragrance of lecithin. How to store CALMO® Lid Care? Store between 2°C and 25°C in a cool, dry place. Can be used up to 4 weeks after first use. Do not use if the safety closure of the bottle is damaged.